If you haven't heard of Amor Towles, it's okay — I hadn't either until about a month ago. If you have, likely because you read and LOVED his first novel, Rules of Civility, then you're probably gaping at the screen, incredulous that anyone HASN'T heard of him. People really love that book. 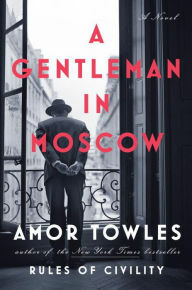 Anyway, the point is: I took a chance on Towles's second novel A Gentleman in Moscow because of how passionate his fans seem to be. I couldn't be happier I did. This novel is utterly spectacular — one of the more purely pleasurable reading experiences I've had in a long time. Towles is clever and funny, wise and profound, and reading him is exactly what you want to reading to be. His story is about Count Alexander Rostov, a Russian aristocrat who is arrested after the Revolution, and sentenced (in 1922) to house arrest in Moscow's beautiful, elegant Metropol hotel. There, Rostov watches 40 years of Russian history unfold vicariously through the eyes of a wild, wonderfully rendered cast of characters, including two precocious young girls, an American diplomat, and the employees of the hotel. Rostov himself is a man of the world — by turns philosophical and sarcastic, charming and witty. Only a writer as gifted as Towles could invent a character as fascinating as Rostov — he's a character I will not soon forget. He knows which French wine goes with every possible dish and can explain Russian literature, Newton's laws, and Greek philosophy as well. We find out in the first third of the novel some of Rostov's backstory — and a tragedy that nearly ends him as well. We learn about Russian history and literature, and we ruminate on some of the similarities and differences between the Soviet collective and the American individual. While not a tremendous amount happens, it's just so fun to read, you don't even notice. In total, this is a novel about making the best of the world you live in — about how your fate is a result of both your choices, but also forces beyond your control. The only thing you can do is live your best life. And part of living your best life should be reading this novel. Extremely highly recommended! Rules of Civility is one of my all-time favorites, and this is on my to-read list for when I'm out of grad school. So glad to hear such a positive review! I don't know how I missed Rules of Civility when it came out, but I immediately put it on my library holds. Can't wait - if it's even half as good as this one is, and I suspect it is based on thoughts like yours, I'm sure it's amazing! I'm reading this book right now and the writing is so elegantly delightful! Should make a lot of Best of The Year list. I have an autographed copy of this novel and look forward to reading it soon. Truly a gifted, rare, and amazing author. Except to those of us that devour the written word on a daily basis, it would be hard to understand the joy of finding such talent. Glee, absolute, wiggle down in my chair with happiness and anticipation, glee. Having completed the book, all I can offer is a request for "more, please." I am content to reread A Gentleman while I wait.